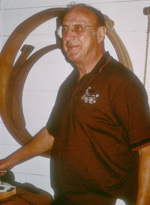 John Bussman grew up on a dairy farm and cheese factory. He worked for 40 years as a cheesemaker, including as president of the award-winning Warren Cheese Plant. John is now president of the Historic Cheesemaking Center in Monroe, dedicated to preserving audio and visual images of early cheesemaking in the U.S. His program included colorful narration of life on the farm and at the cheese factory, accompanied by slides and a demonstration of converting milk into curds and whey. John Bussman has began his retirement and is no longer presenting.